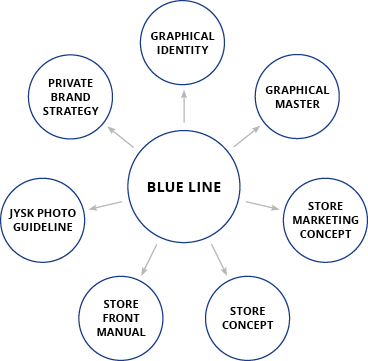 JYSK BLUE LINE is created in order to secure JYSK as a strong and international brand. When following these guidelines it differentiates us from competitors, increases customers’ recognition and reinforces our identity. We want JYSK to speak with one voice across the globe. It takes constant care to create and maintain a global brand. On this website you will find manuals, concepts and tools which secures consistency in the JYSK brand across all channels. The basic rules regarding the JYSK brand influence the content of many different aspects in JYSK. We want JYSK’s identity to be clear and create associations that are consistent across all channels. See illustration below. A BLUE LINE in all of the JYSK areas will contribute to creating and maintaining JYSK as a strong, international brand.